Now I don’t want to sound jaded or pretentious, but when you’ve seen the amount of jewelry I have, it is sometimes hard to stumble upon original jewelry. Beautiful jewelry? Yes! In abundance. But truly original? Hardly ever. 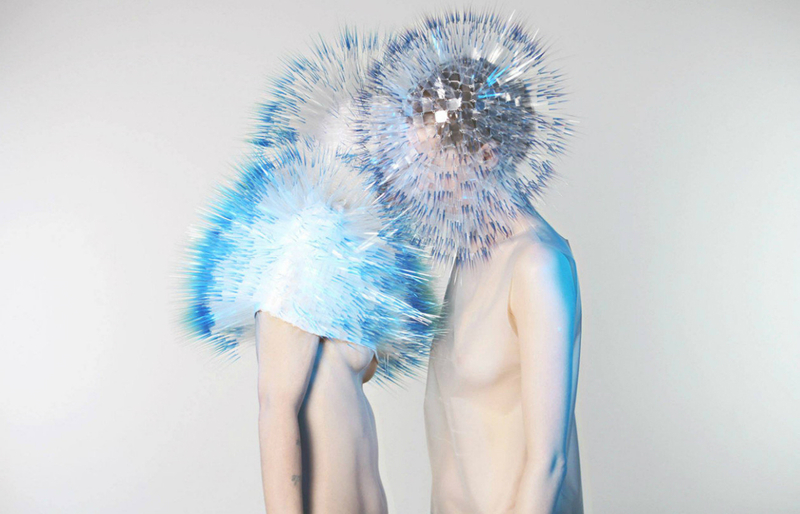 I do remember the first time I saw Maiko Takeda’s original jewelry five years ago though. The images of her first collection literally made my jaw drop and until this day it is still one of my favorite jewelry collections ever. Maiko Takeda, a milliner and jewelry designer, draws inspiration from phenomenons such as shadow, wind and gravity and uses it to create sculptural almost ethereal pieces. She is also an admirer of contemporary theatres and performances which explains the theatrical effect of her first collection. She was said to be inspired by “wearing shadows as jewelry”. The photograph-like images were created by meticulously hand drilling countless holes in metal sheets. The results are these mysterious, theatrical shadows on the body that almost look like stills from a great forgotten film noir from the fourties. Just add a fedora, venetian blind shadows and some cigarette smoke and you’re good to go ;-) . Not surprisingly, it was called the “Cinematography collection”. In the summer of 2013, she presented her second collection, consisting of sculpural pieces covered in acetate spikes. According to an article in Dazed, she was inspired to create pieces that “blurred boundaries to their surrounding environment”. Another inspiration was the futuristic imagery seen in an opera from Philip Glass. When she was invited to display her “Atmospheric Reentry” in the prestigious Joyce Gallery earlier this year, she upped the futuristic ante by adding newly created glow in the dark pieces to the collection. I love the fact that the collection looks futuristic but still looks tactile, almost organic, like newly discovered life forms. Her collections were not only met with great acclaim, they also opened many doors for her. She was able to work with Björk and designed several headpieces for her Biophilia Tour. She recently returned to her homeland of Japan and is now working as an accessories designer for Issey Miyake.